Today I continued spreading a little garden joy: I brought a couple more unexpected basil bouquets to work. If you have extra basil, I recommend it highly. First, most people like surprises of free stuff. Second, you get to talk about your garden and maybe you’ll inspire someone to try growing something—or trade tips and hints. Third, basil grows back if you give it a good trim. I swear the stuff I cut down on Sunday is already growing back despite the crazy heat that we have this time of year. Plus, we still have tons of basil which is absolutely fine with me. I still plan to make some pesto and dehydrate even more. Fransi over at Three Hundred Sixty-Five and I did a little brainstorming the other day and we’re both convinced that herb bouquets would make terrific little gifts when someone invites you over for dinner. If you invite me over for dinner, this time of year your bouquet would be made of rosemary, basil, sage, thyme, oregano, and chives. I killed my lavender some how, but it would have looked pretty in the bouquet. I’d probably tie it up with garden twine then wrap the whole thing in brown paper so I could write something on the outside and close it with a Mortroski Midcentury sticker. And they’d change with the seasons of course. Fall would bring cilantro and dill. And I now realize that I could use some Italian parsley. That would look pretty in a herb bouquet. Imagine receiving an Italian herb bouquet: Italian parsley, oregano, thyme, basil. It would smell amazing. And you could chop it all up and make some sauce. Don’t worry, I’d bring some wine too. Or maybe dessert. Or some fancy chocolate. Or some okra (it seems to be very well received down here). From a practicality standpoint, these bouquets could be great for people with small households or single people. A little of this, a little of that and you’d have a lovely centerpiece that you could use in your recipes all week. Maybe you could even pick and choose what you’d like. I could see the yuppie-hippie grocery store making them, although they’d be exquisitely lovely, but tiny and $20 a pop. Wouldn’t surprise me at all when small packets of even non-organic fresh herbs are $2.50 each. So, if you saw a herb bouquet at a farmers’ market, would you pick one up? 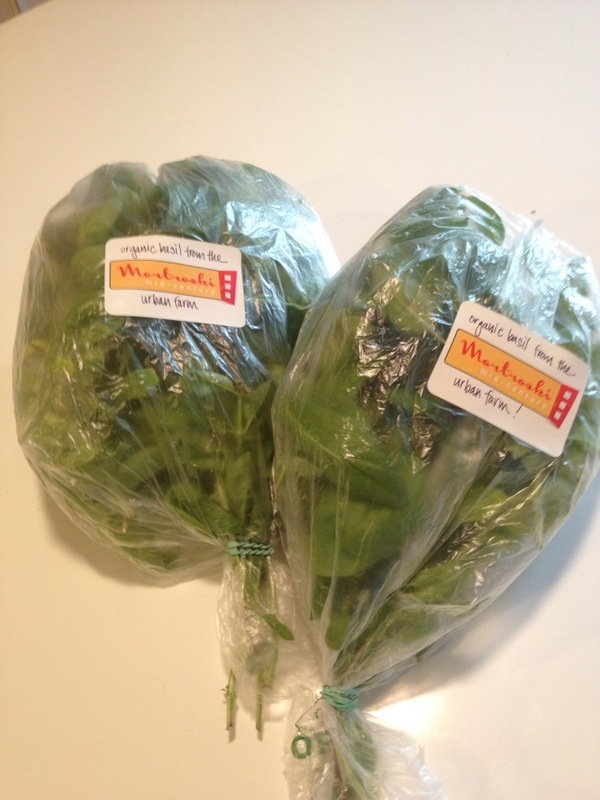 This entry was posted in Sow and tagged basil, basil bouquet, fransi weinstein, Julie Petroski, three hundred sixty-five. Bookmark the permalink. Wish you lived close enough to pop by for dinner. I love your hostess gift idea. Wouldn’t it be cute? And so practical for my foodie friends like you and George. I would. and I have a lot of friends who would love getting them as gifts. Even dried, it would be a nice thing to get. I love this idea! I’m not good at picking out wines, but I could pick some basil no problem. Absolutely! And a recipe too! Totally cool! As soon as we get moved, you’re first on the list for dinner!! Excellent. I even know what kind of wine you like. Oh, don’t think you’re the only one not being a good plant-keeper: my sage is croaking. I think it’s getting too much sun or maybe it doesn’t like that I transplanted it into a container this year. In any case, it’s not good. And if Gidget and George keep running through the place where I planted my bean seeds, we won’t be having harcot vertes this fall at all.